Marine archaeologist Charlotte Bennett is no stranger to risk, but her dives into sunken wreckage are always meticulously planned. However, being the maid of honor in her cousin Samantha’s English wedding gives her a new perspective on her life as a nomad who’s given up on romance altogether. Though an encounter with roguish wedding guest Greg Rawlings leaves her unsettled, the other people she meets make a trip to the tranquil town of Knights Bridge, Massachusetts, enticing. 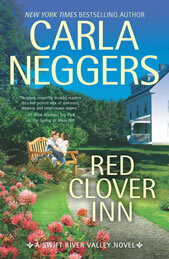 Acting on impulse, Charlotte offers to house-sit at Red Clover Inn while Sam and Justin Sloan are away on their honeymoon. The quaint inn isn’t open to the public yet and Charlotte will have quiet time to plan her next project. It might also give her a chance to see how her cousin found love and a sense of family. But the peace is immediately disrupted when Greg shows up at the inn. The Diplomatic Security Service agent lives a dangerous life, and he, too, wants to clear his head before his next assignment. Juggling work, raising his two teenage children and nursing a wounded heart has left him jaded, and the last thing he expects is to find himself falling for the willful Charlotte. As the attraction between them flares, Charlotte realizes she might be in too deep. And each of them must decide if they can put love first before it’s too late.